This is the concluding chapter of Against Avakianism by Comrade Ajith. Against Avakianism an ideological critique of Bob Avakian, the dogmatic-revisionist leader of the Revolutionary Communist Party of the USA. As one of the leading Maoist thinkers and theoreticians. Ajith has written several significant books and articles and related to land, gender and caste from a Maoist perspective. He was the editor of the international magazine A World to Win, published by the Revolutionary International Movement, a coordinating center of various Maoist parties and forces across the world. He is a heart patient and the Indian fascist regime has imprisoned him since two years, without any medical treatment. 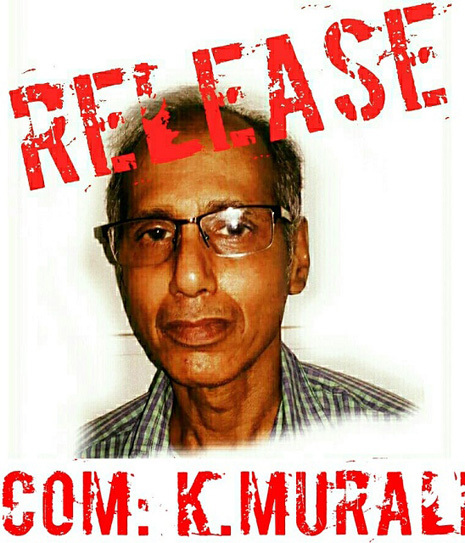 We strongly demand his release and express our solidarity with them, who are raising the voice for his release. The RCP has taken offence over the C(m)PA’s characterization of Avakianism as a “way deeper deviation than that of the UCPN (M)” and demands “Who has aborted a revolution?”1Well, only those who made a revolution can abort it. Therefore, the Avakianists can hardly be blamed of that crime. But what they do is indeed worse. They seek to abort the whole communist movement itself. They try to eliminate MLM as the ideological basis of the ICM and replace it with Avakianism. Their liquidationist, and ultimately rightist, attack is often packaged in ‘left’ form.2 It is deviously presented as an attempt to address real problems faced by the ICM in the context of the setbacks it has suffered. Thus it is less easy to see through its deceptions and that makes it all the more dangerous. Opposing the PCP formulations on Guiding Thought Avakian had said, “… a “Thought” is a more transcendental thing, a more permanent thing, than whatever the line of a party is at a given time. A “Thought” is a category which, as I said, is pregnant with and on its way to delivering an “ism.” So then we will get a lot of different isms, and that’s not good and not correct.”3 Apparently he has tried to resolve this predicament of multiplicity with a ‘synthesis’ that attempts the forced delivery of a new ‘ism’. Every creative application of MLM, leading to the successful development of a revolution (that is an application tested through practice), will surely give rise to a deeper grasp and insight of MLM. It will even contribute new concepts or ideas, which will enrich MLM. But it is not necessary (inevitable) that these contributions will represent a new ‘Thought’. It is even less necessary that they will represent a leap to a new stage, i.e., an all-round development of MLM. Can universality of ideological contributions emerge only if they attain the level of ‘Thought’? Can’t such universality also exist in the line of a party, if it has emerged through a creative application of MLM in the concrete conditions of a country? ‘Line’ is specific to a country and party. It is a particularity. But if it has been formulated through creative application of MLM, then this particularity contains the universality of MLM. It reflects this universality. In the course of its formulation, application, testing through revolutionary practice and development it will lead to new concepts or contributions, which enrich MLM. Even if the development of a revolution only gives rise to a new grasp of MLM, this still would be a qualitative development. It would still hold out lessons for every contingent of the ICM. Some revolutions may achieve even more and generate new concepts or contributions. But, the point to stress, is that all of this is possible even while there is only a ‘Line’ and not yet a ‘Thought’. Or, in other words, a new ‘Thought’ is not a necessary condition for new contributions that enrich our ideology. In this context it is also necessary to examine the view on quantitative development of ideology earlier put forward by the CPN (Maoist). The possible meaning, that is one which makes sense, could be this – deeper understanding, more insight, more grasp, more capacity to apply ideology etc. That is, a development in which no new MLM concepts, laws as such emerge, but only better grasp and capacity to apply existing ones. But this in itself is complex. Any deeper understanding, grasp etc. of MLM, cannot take place without creatively applying it. And creative application will inevitably generate new conceptual knowledge of the laws of that society and revolution. Won’t such conceptual leaps enrich MLM? Even though they are specific to that revolution and society (that is particular) they will definitely enrich the whole body of MLM itself. Quantitative development in the context of ideological development can only be understood as the accumulation of ‘perceptual knowledge’ in the course of the revolution. It is not that new ideas and practices won’t emerge or shouldn’t be raised. But to elevate them to the level of ideology needs verification over a longer period. The example of the CPC’s declaration on Mao Tsetung Thought is a good teacher in this matter. Many major components of what is now accepted as Maoism – philosophical contributions, new democracy, people’s war, development of the party concept, 2 line struggle, ideological rectification, mass line etc. – had already been developed and tested through arduous revolutionary practice before Mao Tsetung Thought was formally stated. Second, these contributions of Mao developed in the course of struggle against right and ‘left’ opportunism, Trotskyism, and dogmatism. Compared to them both the Peru and Nepal experiences were evidently limited. This is not to deny the advanced grasp seen in those revolutions or to negate their important contributions. But this does not justify a Thought or Path or the ideas underlying them. The epistemological gap is even starker in the case of the RCP. Let us for the moment accept their plea that such verification cannot be limited to that of a single country. Let us take the whole international arena instead. What does that show? Avakianism’s concepts and the analysis made on that basis have failed at each turn. The Avakianists have accused the C(m)PA of maintaining the erroneous viewpoint that the application of Marxism in a specific country will automatically lead to the corresponding advance in theoretical understanding. This is baseless. But their accusation brings up the larger question of the relation between the application of Marxism in practice and the development of ideology. Is it incidental or fundamental? The Avakianist’s tend to the former. Practice is incidental in their scheme. Ideology certainly has its own dynamics. It can theorise in advance. But this is vulgarised by the Avakianists when they speak of ‘theory moving ahead of practice’ in order to justify their approach of treating practice as incidental in the development of ideology. Avakianism is quite fond of bringing in the example of the founders of Marxism. It claims that Marx and Engels achieved the synthesis of Marxism from existing theory and not from direct practice. As we noted earlier that is not true. Marx and Engels were quite involved in the class struggles going on in those days, at times even directly. As Mao pointed out, “The basis is social science, class struggle. There is a struggle between the proletariat and the bourgeoisie… It is only starting from this viewpoint that Marxism appeared. The foundation is class struggle. The study of philosophy can only come afterwards.”8 That is, developments in all the three components have taken place through the continuing role of Marxism in guiding class struggle. Every leap in ideology involves synthesis. But Avakianism is neither new nor in any way a synthesis. It is that same old revisionism and liquidationism. 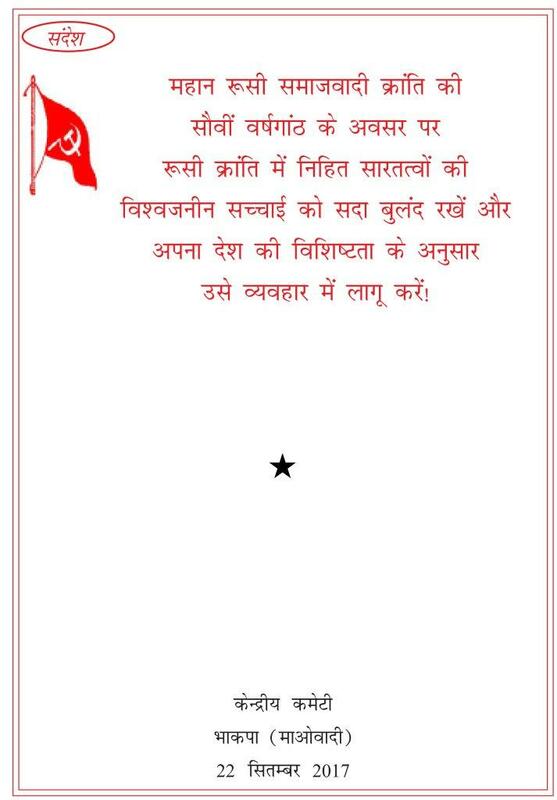 We must reject its claims and stand firm on Maoism. Yes, today the key to grasping proletarian ideology is grasping Maoism firmly. To say this does not in any way separate it from the integral whole of Marxism-LeninismMaoism. Rather, it is imperative to put stress on Maoism in order to sharpen the struggle against revisionism and all other alien thinking. We must uphold, defend and apply Marxism-LeninismMaoism, particularly Maoism. Thus there is a lot of high talk of a visionary communism but the primacy of armed struggle to destroy the existing state is conspicuously absent in the RCP, USA’s program. “Each revolution must specify its guiding thought, without which there can be no application of Marxism-LeninismMaoism, nor any revolutionary development.” (Basic Document of PCP, International Line, Section 4. <http://www.blythe. org/peru-pcp/docs_en/internat.htm>) “Moreover, and this is the basis upon which all leadership is formed, revolutions give rise to a thought that guides them, which is the result of the application of the universal truth of the ideology of the international proletariat to the concrete conditions of each revolution; a guiding thought indispensable to reach victory and to conquer political power and, moreover, to continue the revolution and to maintain the course always towards the only, great goal: Communism; a guiding thought that, arriving at a qualitative leap of decisive importance for the revolutionary process which it leads, identifies itself with the name of the one who shaped it theoretically and practically.” (Fundamental Documents, Section 2, adopted by 1st Congress of PCP. <http://www.blythe.org/peru-pcp/docs_en/fund. htm> ) “…one thing what is sure is that the application of science in the specificities of a particular country gives rise to a concrete thought that guides the movement in that country (which we can assume as quantitative development in MLM) Without the development of such a concrete thought neither can there be a true application of science in any country nor can the revolution there have a continuous forward march.” (‘The Nepalese People’s War and the Question of Ideological Synthesis’ – Prachanda, Worker No:6, page 9. Whatever the ‘description’ this actually is self-contradictory. For example the thesis that every revolution must have a Guiding Thought was a new position put forward by the PCP. Evidently it is part of Gonzalo Thought. But the applicability of this Thought is itself acknowledged to be limited solely to Peru. The PCP was using the formulation ‘Guiding Thought of the party’ even before the people’s war was initiated. Gonzalo played a great role in fighting against revisionism, reorganising the party and charting out the specific line and plans of people’s war. But how can a party claim that a ‘Thought’ has emerged even before its line is put to the test of practice and verified? This contradicts the Marxist theory of knowledge and promotes some sort of idealism. The Avakianist’s insistence that the development of ideology does not need the verification of practice is another example. HYDERABAD: Several civil society groups, adivasi student bodies and political parties like CPI and CPI(M) have demanded that professor GN Saibaba be immediately provided with blankets and other medical facilities at the Nagpur Central Prison. They held a round-table discussion on the issue at ICSSR Hall in Osmania University on Friday. The meeting happened following a letter written by the Professor to his wife Vasantha. He had mentioned that he was not given a blanket though the winter had set in. Saibaba, who has 90 per cent disability and is wheelchair-bound, also said that he was not getting his medicines regularly, causing his health to worsen further. “Though his lawyer visits him every week with medicines, they reach him only 7-10 days later,” said revolutionary writer Varavara Rao. “Barring the right to mobility, a prisoner has all the other rights. But it’s not happening in this case. So Saibaba wants to be shifted to Cherlapally Central Jail in Hyderabad,” he added. Prof Saibaba has been lodged in Nagpur Central Jail since his conviction eight months ago for having links with Maoists. A petition to shift him was submitted on August 23. The panel discussed ways to expedite this process, while also taking up a campaign to get him and the six others convicted in the case released. Meeting in Amalapuran 27th november – defend life Saibaba! Hail the growing wave of peasant’s agitationsin the country! Extend full support to the country’s peasants fighting for their just demands! Build a firm unity of all the people’s movements with the ongoing peasant movement! Only armed agrarian revolution can fully resolve the burning problems of the peasants! 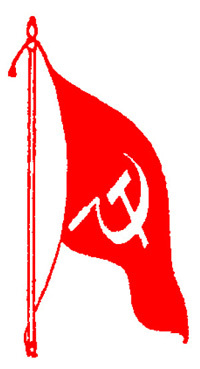 The path of Naxalbari is the only path of liberation for the Indian peasantry! People’s organization from Amalapuram town ask the immediate and freedom for prof. G.N. Saibaba. 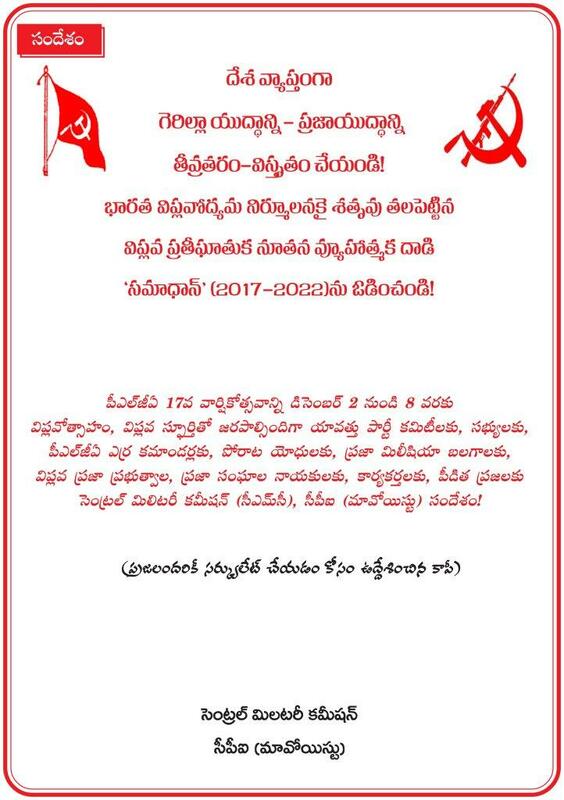 On 10th November, 2017 there is a round table meeting held with all peoples organisations demanding the immediate release of Prof Saibaba at his home town Amalapuram, East Godavari District. Participant organisations are CLC, HRF, CPI, BDMS,PDM,PDSU,CMS, Raitu Cooli Sangham, United Workers Union. Members and activits participated are decided to participate in coming struggles for release of Saibaba. Sent by Baburao, Amalapuram, Civil Liberties Committee. Sources in the Indian press report a new confrontation between repressive forces and members of the Maoist People’s Liberation Guerrilla Army in the Baresandh area of the Latehar district, Jharkhand. Four CRPF troops were injured in the explosion of a mine placed in its path by the Maoists. In the area of Baresandh and its wooded areas of Latehar, the repressive forces have been carrying out operations against communist forces for four days in a district considered a red base. The wheelchair-bound former English professor was convicted in March this year for his Maoist links and for “waging war” against the country. 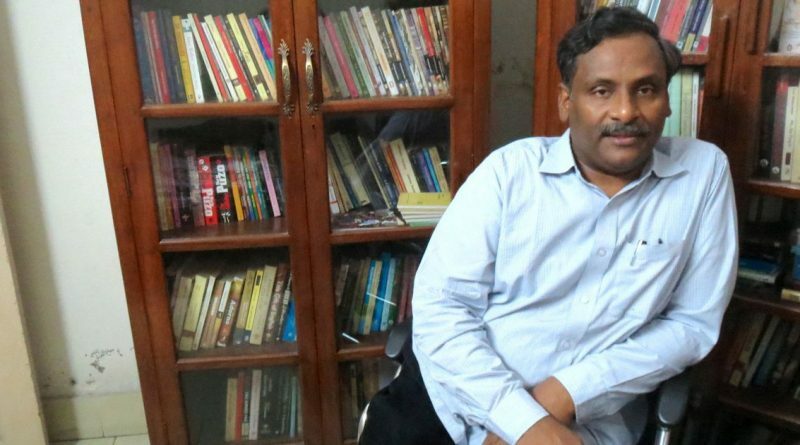 Eight months after former Delhi University Professor GN Saibaba, who is 90% disabled, was sentenced to life imprisonment, he has written a letter to his wife stating that he will not survive the coming winter. The wheelchair-bound former English professor at Ram Lal Anand college was convicted for his Maoist links by a sessions court in Maharashtra in March this year. 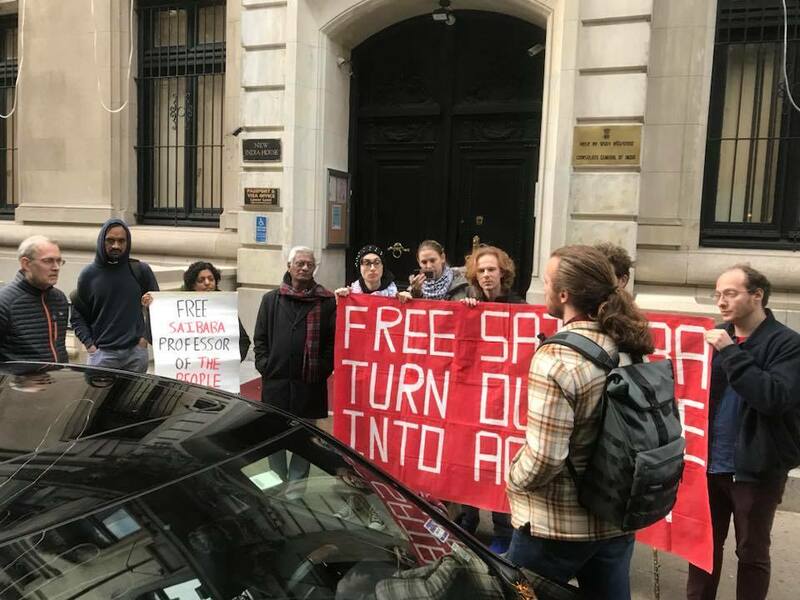 In the letter that appears to be have been written in late October, Saibaba urges his wife to finalise his legal counsel at the earliest and asks her to inform his advocate, Surendra Gadling, to file his bail application in the first week of November or last week of October. “You remember if this is not done in this way, my situation will be out of hands. I am not responsible. I am making clear to you. Hereafter I am not going to write about it any longer,” reads his letter. He concludes his emotional letter by asking his wife to take care of her health. In an interview with DNA, Vasantha alleged that her husband was not receiving basic medicine and that his health was deteriorating. She also said she would visit Saibaba in jail on November 14. 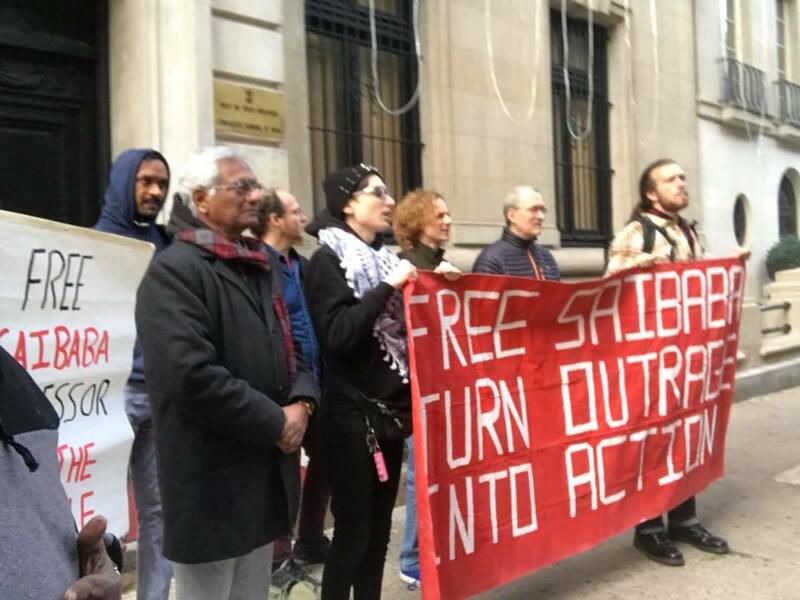 In March this year, Saibaba along with four others, including former JNU student Hem Mishra and journalist Prashant Rahi, were sentenced to life imprisonment by the Gadchiroli Sessions Court in Maharashtra for their Maoist links and for “waging war” against the country. Saibaba was first arrested in May 2014 from his residence in Delhi based on ‘incriminating material’. According to The Wire, JNU student Mishra had told police during interrogation that he had acted as a courier between the professor and Maoist leaders. The former professor was, however, granted bail after 14 months in jail. In March 2016, the Supreme Court had granted him bail on health grounds after his bail application had been rejected by the Bombay High Court, reported CNN News 18.